We interrupt your regularly scheduled blogging to bring you…SPEWSAPALOOZA 2014! We’ve all been struck down with gastro and I’ve had no time to blog as I’ve been looking after a baby who looks like this all day (and all night). Also accompanied by a really annoying ‘urrrrrrrrr’ ‘urrrrrrr’ ‘urrrrrrrr’ noise. To make it more fun the man was away for work! I ended up going to emergency on Friday as little man was just vomiting repeatedly and not taking any fluids on (just a few ml of water here and there). I coped pretty well with him on my own all day until about 5pm when the ‘urrrrr’ ‘urrrrrr’ ‘urrrrrrr’ noise got a bit much and I phoned a friend, or my Mum to be more exact. And I didn’t call her, I texted her. By about 6pm that night I started feeling very average myself and ended up opening the technicolour fire hydrant in the hospital carpark. Even more disgusting was that I got puke on my shoe (it’s okay, it washed out). Thankfully when I’d started feeling it coming on the doctor also gave me some maxalon which I took when I got home and stopped me making anymore pavement pizza. Mum very kindly came and stayed on Friday night and looked after us both and delivered me some delicious soup (see photo below) on Saturday which helped a lot! Unfortunately she is now praying to the porcelain gods herself. Three generations of germs! Sorry Mum! Seriously though this soup is amazing. 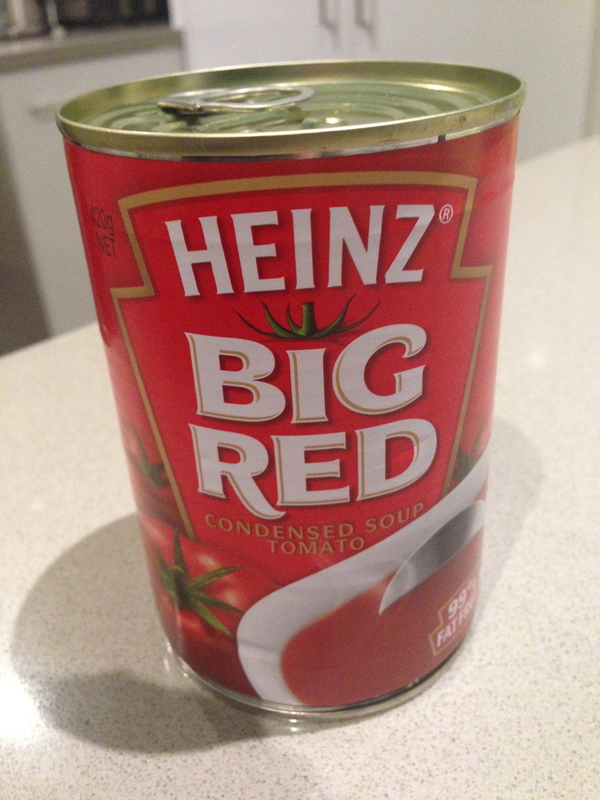 Add the soup to a saucepan then fill the can with milk, add to the ‘soup’, heat and serve with toast and butter. I’m sure its full of nasties but its my ultimate comfort food. Little man is on the mend but is still mostly refusing bottles, I managed to get 60ml into him before bed tonight and that was a battle. I suspect he might also be teething which doesn’t help! Anyway, a pretty good excuse not to be keeping up with my ’50 things to post about’. I should resume regular programming in the next couple of days! Until then, stay well and try not to paint the town green! This entry was posted in 50 things to post about, A post about nothing. Bookmark the permalink. Your “gross out” FB comment immediately made me think of this. I’m still waiting for it to happen in our house. I have a gas mask just in case.